Race Day is here for the Bathurst 12 hour race. Race day is finally here for this year’s Liqui-Moly Bathurst 12 Hour race. 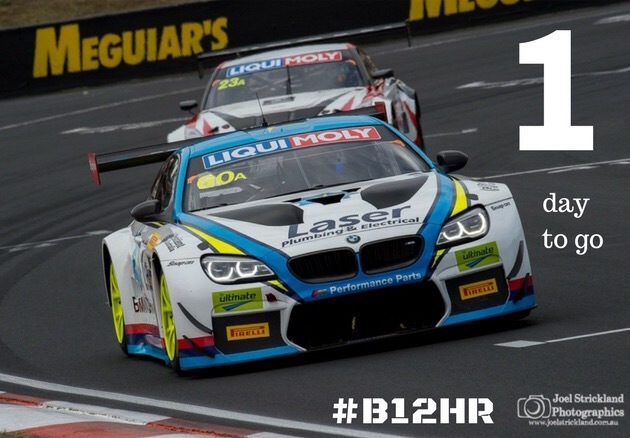 1 day until flag drops on 2017 Liqui Moly Bathurst 12hr event. 1 day to go till race day. Great to see the Laser Racing Steve Richard Motorsport BMW M6 GT3 topping the time sheets yesterday. Looking forward to see how the guys go in qualifying today. Then we have a Top 10 shoot out this afternoon. 4 days to go till race day at the Liqui-Moly Bathurst 2017. We are down till just 4 days till the green flag drops on this years race. 5 days until flag drops on 2017 Liqui Moly Bathurst 12hr event. 5 days to go till race day at the Liqui-Moly Bathurst 2017. 6 days until flag drops on 2017 Liqui Moly Bathurst 12hr event.